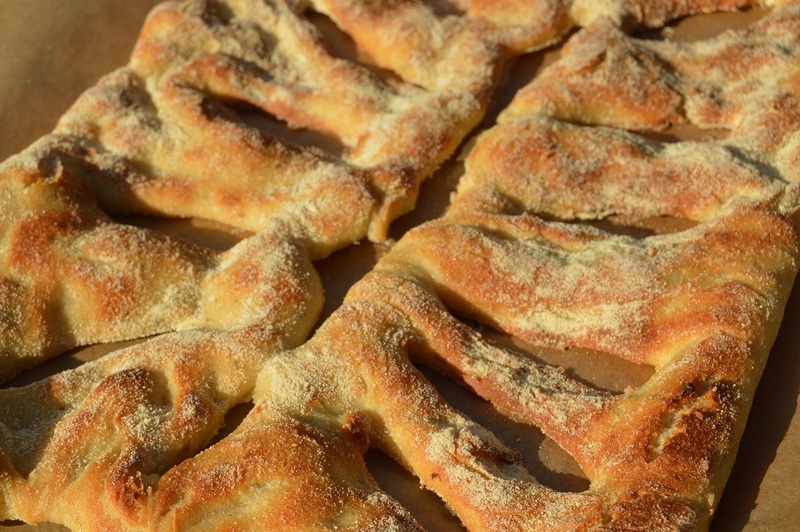 Fougasse is such a lovely bread, with a very crisp, shattering, crust and a soft interior. 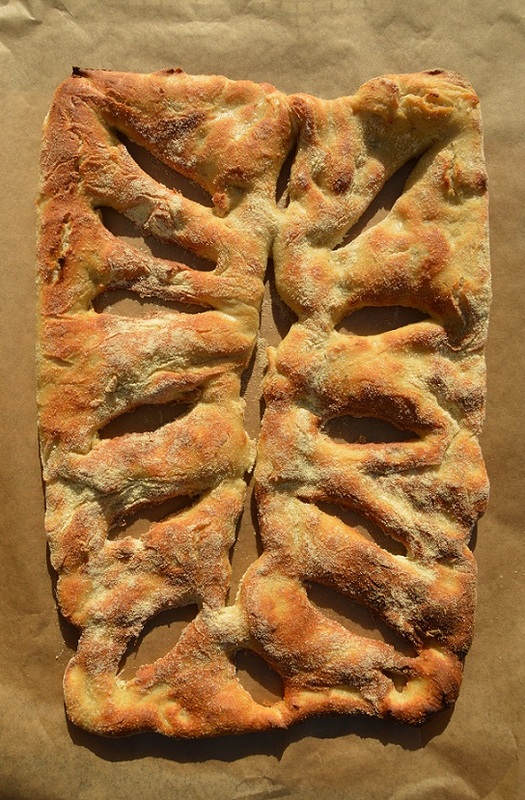 It is especially great as a tear-and-share bread, but I invariably find that once I get my hands on fougasse, sharing is a difficult option! 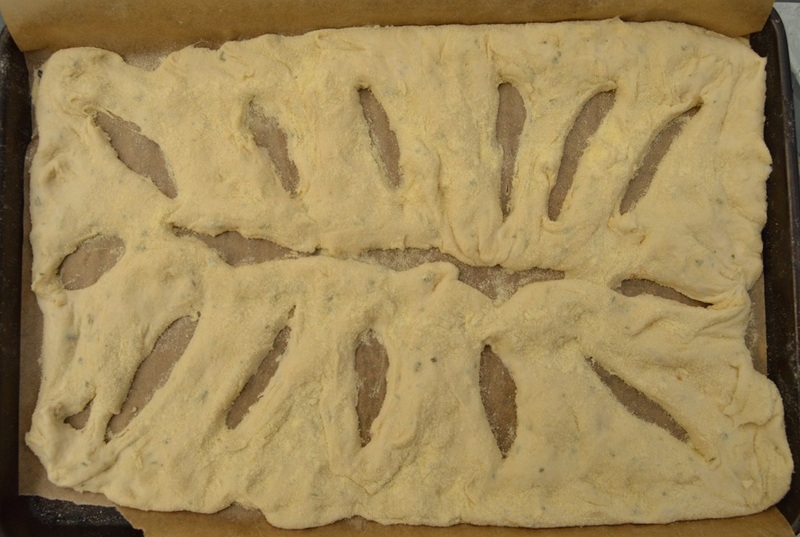 Rosemary and garlic are gutsy flavours that work well in fougasse. As I often do when using garlic in doughs, I roast it slowly in oil until it becomes golden brown, squidgy and takes on that lovely sweet flavour. The roasted garlic gets worked into the bread dough, along with the fresh rosemary, at the start so that their flavours runs throughout the bread. With bread it is all about getting a terrific depth of flavour and as I often like to do with breads, I have used a pre-ferment/poolish: made up in moments, but left overnight to work its magic, the pre-ferment is just flour, water and a little bit of yeast that gets mixed together and left to ferment overnight. 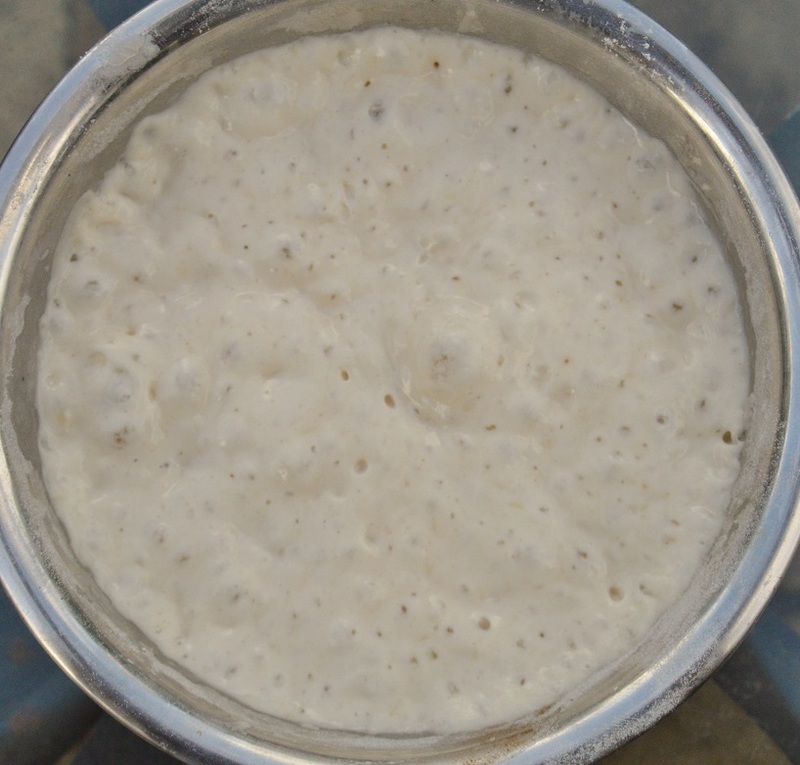 Seriously, if you have never made a pre-ferment for a bread dough, I would urge you to try it: it is so simple and gives wonderful results in terms of both flavour and texture. Especially in a bread such as fougasse that does not need much of a second rise. If you don’t want to make a pre-ferment, simply increase the flour in the recipe to 500g and the water to 350-400ml. Don’t rush the rising of the dough by putting it into a very warm place such as an airing cupboard or a conservatory: a cooler environment gives a slower rise and this gives a much better flavour. With this in mind, I usually leave the dough on the work surface (my kitchen is usually quite cool), but I have pop in the fridge for several hours or overnight: just let it fit in with you! 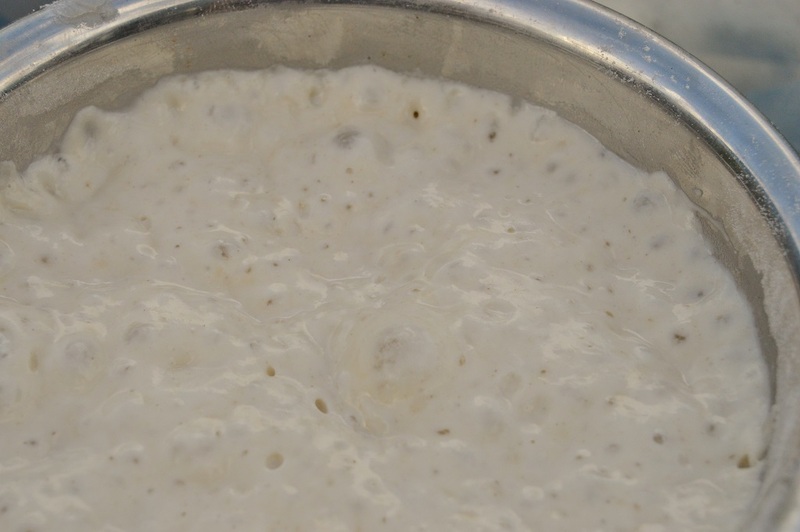 (1) Make the pre-ferment: the night before simply mix the flour and yeast together. Add the water and mix to form a thick batter. Cover with clingfilm and leave at room temperature overnight or even up to a couple of up days or so: the longer it is left, the more pronounced the flavour will be. (2) The following day, put the garlic and oil into a small oven-proof container, stirring them together. Roast at about 130C(fan) for between 45 minutes and an hour, or until the garlic is soft and golden brown. Leave to cool. (3) Mix the flour, yeast, rosemary, garlic powder and salt together. Add the roasted garlic, along with the oil it was roasting in, the pre-ferment/poolish and enough water to form a soft and slightly sticky dough. Knead for 10-15 minutes on the work surface, without any flour added, until smooth and elastic. Note 1: the dough will feel unmanageable to begin with, but after about 10 minutes it will become smoother. A dough scraper is invaluable here, periodically using it to scrape the dough off your hands and the work surface. Stretching the dough onto itself repeatedly helps develop the gluten. Note 2: you can instead pop the dough into a food mixer with a dough hook,going for a medium to high setting setting, but there is something so wonderful about the feel of a bread dough. (4) Put the dough in a lightly oiled bowl and cover with clingfilm. Leave to rise at room temperature until at least doubled in size – this should up to a couple of hours depending on the temperature of the kitchen, but don’t try to rush it by popping it in the airing cupboard: the slower the rise, the better the flavour. (5) Turn the dough onto a work surface that has been dusted with fine semolina. Split the dough into 3 pieces and dust each with semolina. 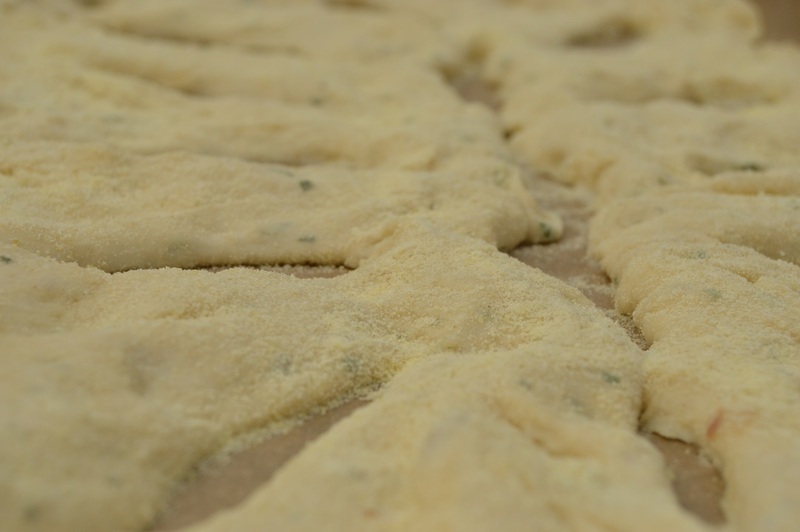 Place each piece of dough on baking sheets that have been lined with greaseproof and also dusted with semolina. Sprinkle a little semolina on the surface of the dough, which stops the dough sticking to your hands. Pat down gently, spreading out to a rough oval shape, trying not to deflate the dough too much. (6) Make a cut or two lengthways down the middle of each dough, making sure you don’t go to the edges. Then make several diagonal cuts on each side of the main cut, almost resembling stems of a leaf. Gently pull the dough outwards to spread it out some more and to enable to cuts to open up a little. You don’t need to be too precise with this: it is a rustic bread and holes of different sizes are absolutely to be applauded! (7) Leave to rest, uncovered, for about 20 minutes, at room temperature while you pre-heat the oven to its highest setting. Put a solid roasting tin on the bottom of the oven. (8) When the oven has reached temperature, pour cold water into the roasting tray which will help create steam in the oven. 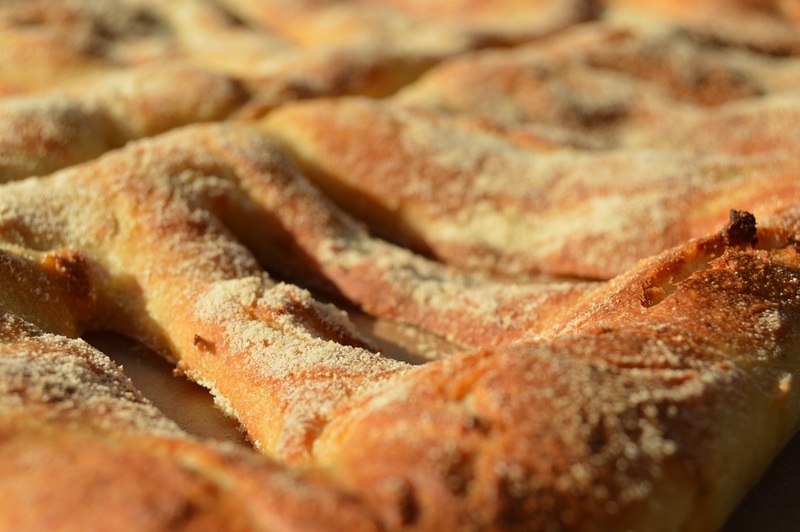 Sprinkle a little flour or fine semolina over each fougasse and bake in the oven for 10 minutes. After 10 minutes turn the temperature down to 220C (fan oven). Bake at this temperature for about 10 more minutes until golden brown. Cool on wire racks.